Be Bond, James Bond: Put yourself behind the wheel of an Aston Martin and tour some of the iconic locations featured in The Spy Who Loved Me, From Russia with Love, and Skyfall. On the Luxury Ashton Martin 007 package, you’ll drive an Aston Martin DB9; stay two nights at Isle of five-star Isle of Eriska Hotel, a castellated Relais & Chateau-member mansion on a private island; learn how to make the ultimate martini; and even take a speedboat trip to Duarte Castle, the family seat of the alleged real-life inspiration for 007. The itinerary suggests picking up the car in either Edinburgh or Glasgow and visiting Glencoe, setting for the final scenes in Skyfall, before arriving at the Isle of Eriska. While at Eriska, cruise to Duart Castle, the MacLean clan seat restored in the early 20th century by Sir Fitzroy Donald MacLean. The exploits of Fitzroy Hew MacLean are said to have inspired Ian Fleming’s creation of James Bond and 007. On your final day, return to Edinburgh or Glasgow visiting the moor made famous in From Russia with Love, the loch by Crina where the boat chase through the Bosporus was re-enacted, the Rest and Bet Thankful Pass depicted in Skyfall and the naval base shown in The Spy Who Loved Me. The Luxury Aston Martin Weekend package, offered by custom tour operator McKinlay Kidd is available from April through October. Rates begin at £1250 per person, based on double occupancy. 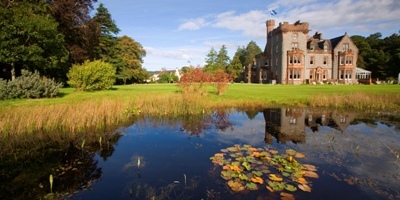 Tags: 5 star, Isle of Eriska. Bookmark the permalink.